The challenge in making sense of the array of relevant outcome studies has been made much easier due to the increasing number of pertinent meta-analyses that are now published (for example, Beck & Fernandez, 1998; Del Vecchio & O'Leary, 2004; DiGiuseppe & Tafrate, 2003; Edmonson & Conger, 1996; Tafrate, 1995). Perhaps it is no surprise that such work has reviewed the field from a predominantly CBT standpoint with outcome research focussing particularly on group therapy interventions for anger and aggression. Whereas the consistent findings appear to be moderate to strong effect sizes for CBT-based procedures, consideration of inclusion criteria and other procedural characteristics render direct comparison between the different analyses highly problematic. Hence, for example, whilst acknowledging the contribution of the previous reviewers, Del Vecchio & O'Leary (2004) are critical of this earlier work for a number of reasons. These reflect concerns regarding the 'caseness' of sample populations, selection of only published studies, conceptual confusion about the anger construct itself and finally the homogeneity of the study populations covered by the analysis. In order to address some of these concerns in their own study, they focussed exclusively on adult outpatients whose 'caseness' rested on scores on standardised measures. As a result of such restrictions almost three-quarters of the papers included involved (routinely self-selecting) undergraduate students. Strangely, this powerful bias did not appear to concern the authors, although they at least acknowledged that these papers were almost exclusively drawn from the same laboratory! In order to make sense of this confusing picture, we earlier proposed a classification of approaches into four distinct classes: 'Discrete/Autonomous'; 'Discrete/Directed'; 'Integrative/Constituent'; 'Integrative/Embedded' (Figure 13.1). The remainder of our consideration of outcome evidence will use these in the hope of assisting comparison. The bulk of the programmatic approaches to anger management and treatment appear to fall into this class of activities and the evidence presented in a number of the meta-analyses (Beck & Fernandez, 1998; Edmonson & Conger, 1996; Tafrate, 1995) generally support the broad efficacy of Directed anger treatment approaches. The strongest evidence relates to Discrete/Directed applications where there has been some clinical assessment/diagnosis of (various offender or non-offender populations) and an informed application of anger techniques (particularly 'anger management' and 'anger treatment'). Additional, evidence has been presented regarding mentally ill (Haddock et al., 2004) and mentally disordered offender populations (Renwick et al., 1997) which attests to the potential utility of anger treatment with patients diagnosed with serious mental illness. Indeed with respect to the latter, material in preparation from work at the State Hospital in Scotland (Ramm & Novaco, 2003) confirms substantial treatment gains and behavioural change with such patients following anger treatment interventions. Although clearly an area of significance to both practitioners and legislators (Novaco, 1996), as yet there appears to have been insufficient work to justify specific meta-analytical review. Certainly, this is an area requiring further development. Equally pertinent to this Directed application of anger techniques is activity undertaken in respect of child and adolescent populations (Dangel, Deschner & Rasp, 1989; Lochman, Barry & Pardini, 2003; Sharry & Owens, 2000). Much of the outcome analyses in this domain has been subject to recent meta-analytic review (Sukhodolsky, Kassinove & Gorman, 2004). Evidence found the mean effect size was in the 'medium' range and broadly consistent with other psychotherapeutic interventions with this population. Their analysis of both component and multi-modal approaches, concluded that the latter produced greater treatment gains in respect of aggressive behaviour and interpersonal functioning. Work falling under the Discrete/Autonomous descriptor has predominantly consisted of procedural programatic anger management packages with general inclusion criteria. In the US this has almost exclusively involved outpatient student samples; by contrast, elsewhere (especially the UK and Australia), the majority of the activity has been centred around mainstream offender populations (Ireland, 2004; Law, 1997; Munro & MacPherson, 2001; Towl, 1995; Towl & Dexter, 1994). In respect of the latter, the body of published material covering this field is certainly heterogeneous in respect of a number of critical issues, including client characteristics, programme content and outcome evidence. Overall, therefore, we would wish to sound a fairly cautious note regarding any conclusions that can be drawn, other than self-evidently anger management cannot be applied as a universal remedy for violent offending. It has been concluded that the routine allocation of violent offenders to a common anger intervention package may be counter-productive and wasteful of resources (Howells et al., 1997; Travis, 2006). Therefore, some criminal justice models of intervention may benefit from incorporating elements of the Discrete/Directed approach found more readily in mental health, which emphasises individual assessment, formulation and treatment planning (Howells, Day & Thomas-Peter, 2004). Again, much systematic work requires to be undertaken to provide clarity in a clearly critical area. This class of activities was sub-divided into Embedded and Constituent. Integrative Embedded describes those (often unreported) circumstances where anger issues emerge during the course of more general psychotherapeutic intervention, and are construed as an aspect of the case formulation. In this context, it is commonly the case that the anger aspect of formulation and treatment remains unreported, minimised or undifferentiated. As a result of this (and for other reasons), adherents of such approaches have abstained from conducting empirical examination in this area. We have argued above that this can be seen to typify more traditional psychodynamic psychoanalytic orientations but this is by no means exclusive to this approach. Thus for example, conventional CBT-based approaches towards the assessment and treatment of PTSD (for example, Foa, Steketee & Olasov-Rothbaum, 1989) continue to underestimate the significance of anger, despite compelling evidence regarding its salience (Gerlock, 1994; Novaco & Chemtob, 1998). By contrast, the term Integrative/Constituent was used to describe those circumstances where addressing anger, although remaining integrated within broader therapeutic activity, is more clearly delineated. Examples of such an approach can be found within both the psychoanalytic and cognitive behavioural literatures but, as yet, the only systematic outcome evidence that falls into this category comprises 'component' CBT procedures for addressing client anger difficulties. In this regard evidence has been accrued indicating the utility of relaxation procedures (O'Donnell & Worell, 1973), exposure-based procedures (Brondolo, DiGuiseppe & Tafrate, 1997; Grodnitzky & Tafrate, 2000); systematic desen-sitisation (Rimm et al., 1971) and cognitive-based techniques (Dahlen & Deffenbacher, 2000; Tafrate & Kassinove, 1998). It is to be noted that this work has, again, predominantly involved student samples, hence its application to more serious clinical populations cannot be assured. 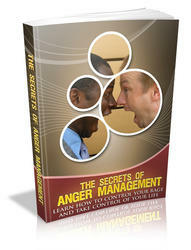 Learn how to control your rage and take control of your life. Everybody has likely felt anger at one time or another. While particular individuals get angry more often than others and have regular, intense outbursts, others tend to bottle their feelings and then blow up or flare up without warning.